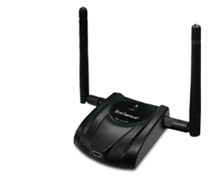 Product Description: The Wireless-N USB Adapter (NUB-9701 EXT2) implements the latest 11n technology which extremely improves wireless signal for your computer than existing wireless 802.11g technology. The incredible speed of Wireless-N USB adaptor makes heavy traffic networking activities more flexible and takes the wireless into practical road. You could enjoy the racing speed of wireless connection, surfing on Internet without string wires. For more security-sensitive application, NUB-9701 EXT2 supports Hardware-based IEEE 802.11i encryption/decryption engine, including 64-bit/128-bit WEP, TKIP, and AES. Also, it supports Wi-Fi alliance WPA and WPA2 encryption. WPS support which makes users easier to setup WiFi security.Cisco CCX V1.0, V2.0 and V3.0 compliant. Senao NUB-9701 EXT2 is Ralink RT2870 series USB Wireless LAN Card. If you need Linux or Mac OS Driver for Senao NUB-9701 EXT2 Adapter, you should try Ralink RT2870 drivers for Linux and Mac OS.